The A.I. 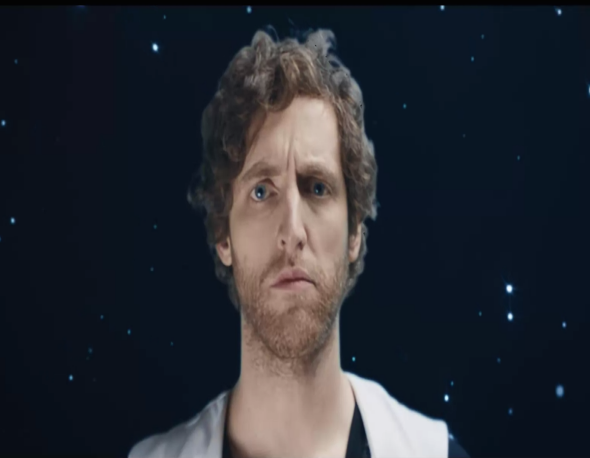 scripted film Sunspring, starring Thomas Middleditch, shows the limits of computers. Contemporary artificial intelligence algorithms are surprisingly good at wide range of tasks, from driving cars to playing Go. One thing they haven’t mastered yet? Creative writing. That’s the lesson of Sunspring, a new science-fiction short with a script composed by a recurrent neural network. (You can watch it here.) Far from suggesting that computers will be winning Academy Awards any time soon, it shows how much humans can still make meaning as we struggle with them. As Annalee Newitz explains in Ars Technica, Sunspring is the creation of director Oscar Sharp and A.I. researcher Ross Goodwin. Goodwin created the algorithm that spat out the script, training it on dozens of other film and television scripts that he found on the internet. They shot the film in two days, aided by a substantial crew and a cast of three actors, including Thomas Middleditch of Silicon Valley. “The question for us,” says one of the filmmakers in a behind the scenes clip that plays over Sunspring’s credits, “is, Can a computer write a screen play that will win a competition?” The answer to that question, of course, is a flat no—at least not yet. Though the film came in the top 10 of the Sci-Fi London 48 Hour Film Challenge, it clearly didn’t do so on the basis of its script. To the contrary, it succeeds, to the extent that it does, in spite of its mechanized origins. Nothing here resembles a story, partly because the dialogue is so choppy. Sometimes there’s a charming, slightly surrealist quality to the words assembled by Goodwin’s algorithm, as when the scruffy Middleditch mumbles, “It’s a damn thing scared to say. Nothing is going to be a thing.” Elsewhere, the script collapses into outright grammatical incoherence: “I just wanted to tell you that I was much better than he did,” another character emotes while staring into the camera. Everyone involved has clearly brought a great deal of interpretive effort to the proceedings, but they can only do so much. Even at its best moments, Sunspring feels like a movie shot in a foreign language you once studied but never really understood. You keep getting the sense that there might be something meaningful here, but mostly because you’re looking for meaning, not because it’s actually available. In spite of all this, Newitz claims, “The AI has captured the rhythm of science fiction writing, even if some of [the algorithm’s] sentences are hilariously nonsensical.” Given how heavily the resulting film trends toward the incomprehensible, though, it’s hard to feel those rhythms in the final project. Indeed, were it not for the characters’ retro-futuristic outfits—Middleditch, for example, wears a shiny gold and silver jacket that would have fit in at this year’s Met Gala—and a few other visual details, there’d be little reason to think of it as science fiction at all. To some extent, that may be because the algorithm’s source material isn’t especially coherent. According to Newitz, the filmmakers fed their computers numerous X-Files scripts, as well as material from programs such as Star Trek and Futurama. Peruse the full list of scripts (which runs at the start of the film), and you’ll also spot less obviously germane selections, including Silver Linings Playbook and Scary Movie 2. Though fretting over genre boundaries is rarely productive, it would be a stretch to slot either of these films into the same rubric. But, then again, we also probably wouldn’t consider Sunspring to be a science fiction short if we weren’t explicitly told that it was one by its human filmmakers. That’s fitting, because it’s ultimately the question of human involvement that makes Sunspring interesting. As with the supposedly A.I.–written novel that recently competed for a Japanese literary prize, the most compelling details here were actively shaped by the cast and crew. Consider the score, which adds a level of emotional intensity to the surrounding gibberish. Or watch for the blocking and editing, which suggest relationships between the three characters that we would never be able to discern from the dialogue alone. And if the finished film is “hilarious and intense,” as Ars suggests, that has more to do with the deeply felt, if sometimes overwrought, performances by Middleditch and his co-star Elisabeth Gray.